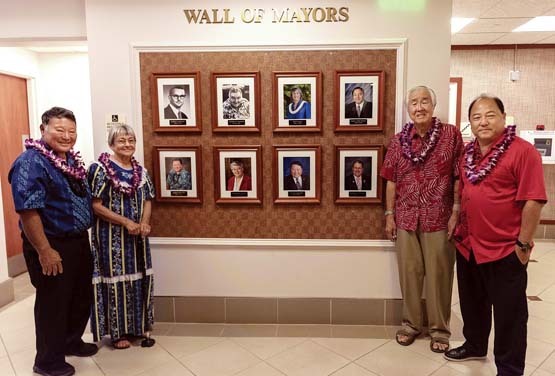 In the waning days of his administration, former Mayor Alan Arakawa put up a “Wall of Mayors” in the Mayor’s Office on the ninth floor of the county building. A ceremony was held Dec. 27 to honor the former mayors — Elmer Cravalho, Hannibal Tavares, Linda Lingle, James “Kimo” Apana, Arakawa (twice), Charmaine Tavares and Michael Victorino. Shown in the photo are Arakawa (from left); Theresa Browning , sister of Cravalho; Howard Nakamura, managing director for Hannibal Tavares, and Apana. In addition, a wall honoring past managing directors also was put up in the Mayor’s Office.